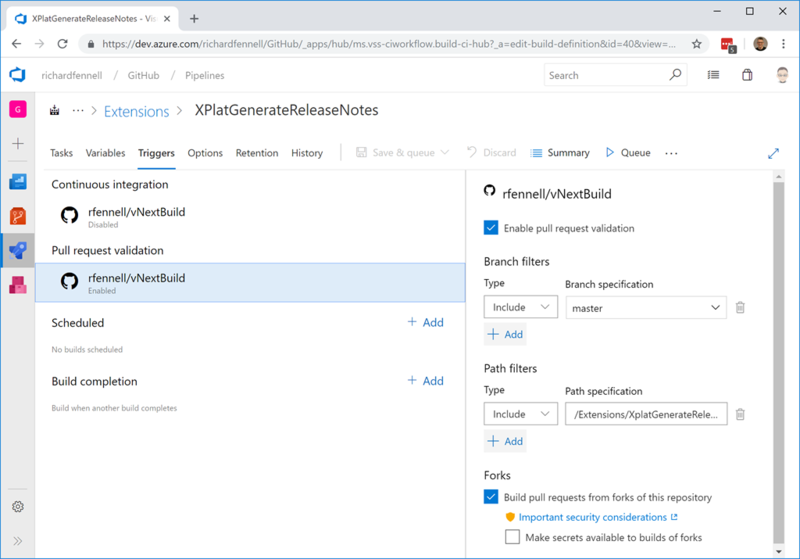 Using Paths in PR Triggers on an Azure DevOps Pipelines Builds – But it works on my PC! When I started creating OSS extensions for Azure DevOps Pipelines (starting on TFSPreview, then VSO, then VSTS and now named Azure DevOps) I made the mistake of putting all my extensions in a single GitHub repo. I thought this would make life easier, I was wrong, it should have been a repo per extension. I have considered splitting the GitHub repo, but as a number of people have forked it, over 100 at the last count, I did not want to start a chain of chaos for loads of people. This initial choice has meant that until very recently I could not use the Pull Request triggers in Azure DevOps Pipelines against my GitHub repo. This was because all builds associated with the repo triggered on any extension PR. So, I had to trigger builds manually, providing the branch name by hand. A bit of a pain, and prone to error. 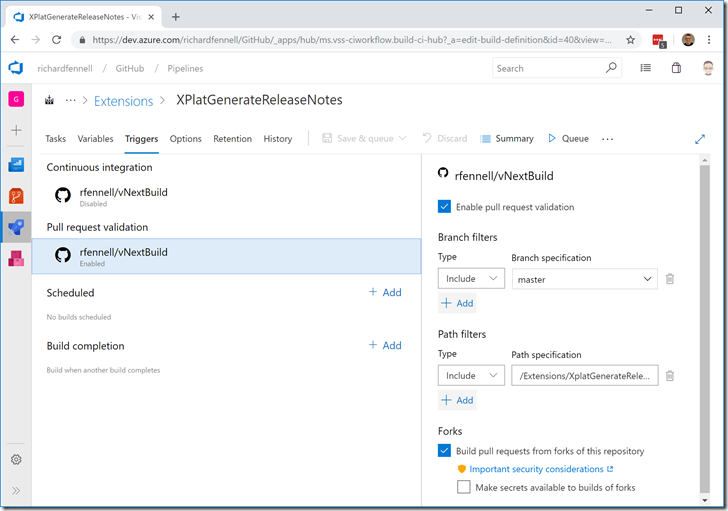 I am pleased to say that with the roll out of Sprint 140 we now get the option to add a path filter to PR triggers on builds linked to GitHub repo; something we have had for Azure DevOps hosted Git repos since Sprint 126. So now my release process is improved. If I add a path filter as shown below, my build and hence release process trigger on a PR just as I need. It is just a shame that the GitHub PR only checks the build, not the whole release, before saying all is OK. Hope we see linking to complete Azure DevOps Pipelines in the future.